It always starts in the middle of the night with the overpowering scent that I can barely tolerate. It comes to me, it calls to me, it speaks to me in my dreams. I wonder if it effected the other women that made the Radiant Heart before me in the same way. This is the way it always begins. The scent and the imagery almost haunt me until the blend has been mixed. I am so fortunate to make this essential oil available to you. Sacredness, mysticism and tradition are all combined in the making of this sacred oil. Twice a year rich aromas awaken me in the middle of the night. Dreams follow to guide me through the process of combining essential oils, drop by drop till a whole batch is made. I love the time around the Radiant Heart. The energy of love is so strong, evident, humbling and inspiring, all at the same time. There is so much more to life than we normally experience. During the times of making the Radiant Heart, the harshness of everyday life is more evident. Yet, instead of getting disillusioned or afraid, my heart gets stronger to stay in the silence of the Radiant Heart energy, and see how life responds with loving and effective solutions. Something in the thought and feeling process changes and instead of being afraid, nervous, or threatened, I see solutions and possibilities, and I am able to communicate with strength and compassion. It is truly magical how chaos mystically calms, people that are really irritated, quickly calm down, listen and instead of fighting are open to a fruitful discussion. It is magical how people open in an instant. The fact that this is possible shows the sacred quality of the Radiant Heart Essential Oil. Again, I would like to thank all of you who are participating with the Radiant Heart. You are an integral part of the bi-annual celebration. Every time this sacred essential oil is made, it gives us more insight into how to live our lives from the heart, having love, truth, respect and freedom as our guides and our authorities. The message of the Radiant Heart throughout the centuries is consistently the same. The Radiant Heart shows us the essence of unconditional love. It also helps us leave stress, fear and nervousness behind and wake up to the calm, creative and innovative part of ourselves that naturally and freely expresses love and compassion. This year the Radiant Heart 2015 can help us open our hearts to our own lives, help us rethink how we live, and help us realize what is truly important to us. It is never too late to wake up from wherever we are in our lives, good or bad, and begin to live our lives with love, compassion, freedom and truth as our authorities. All of our lives are meaningful and precious, as the life we have right now is the only life we have. We are important as we are part of the whole, effecting and contributing to our own lives, our families, friends, the community and society at large. Once we feel how precious life is, we begin to naturally interact with others in a more loving, compassionate and respectful way. Initially, especially in difficult situations, it may not be easy to follow the guidelines of love, truth, respect and freedom When life does become difficult, the Radiant Heart can step in and help, so we are able to respond to negative events in our lives in calm, forward thinking and loving ways. Using the Radiant Heart Essential Oil teaches us how to respond appropriately, as it activates a deep inner silence within us, from where we can draw wisdom and understanding. Once wisdom and understanding is ignited, we are able to cut through fears, aggression, and violence. We all have this very powerful energy within us that can be awakened. Once we feel this empowering energy, we will be able to integrate it into our everyday lives. Here is how to start using the Radiant Heart to activate the incredible energy within you. Inhale the Radiant Heart blend though the nose from the bottle once for 1 to 2 seconds. Next, repeat the following three sentences 9 times each in sequence just before you go to sleep at night. The Radiant Heart Summer 15 Essential Oil is available now in a very limited quantity. 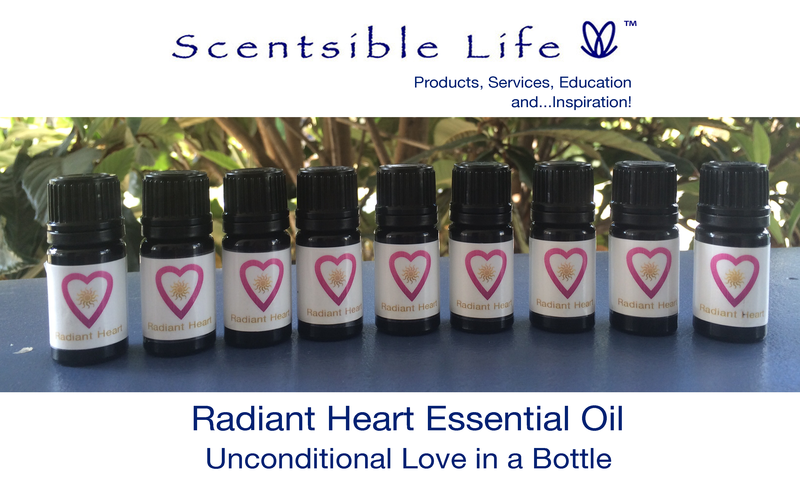 If you are interested in the Radiant Heart blend please call me at 310.699.7743.